With utilization at the highest levels in years, the ALL Family of Companies announced it has purchased five Liebherr all-terrain mobile cranes: two LTM 1220-5.2, two LTM 1100-4.2, and one LTM 1350-6.1 models. The 265-ton, five-axle LTM 1220-5.2 is engineered for maximum lifting performance. The total weight of the crane is fully utilized to optimize load capacities. With a 44- to 197-foot telescopic boom extension and a 40- to 141-foot long folding fly-jib system, the LTM 1220-5.2 sets the standard when it comes to lifting height and boom length. 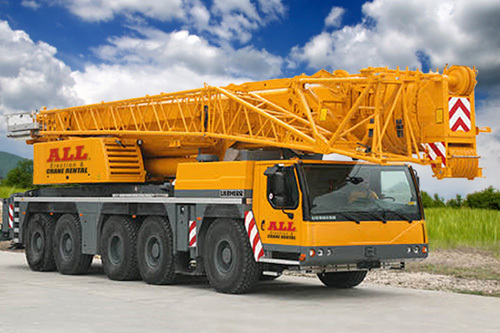 The 110-ton LTM 1100-4.2 is a top-capacity member of the four-axle mobile crane class. The 38- to 197-foot telescopic boom can be extended by lattice boom parts and a double 35- to 108-foot swing-away jib. The 400-ton LTM 1350-6.1, the largest of this mid-range package, sets the benchmark for the six-axle crane class. Introduced at CONEXPO 2011, it features a 49- to 230-foot telescoping boom and 20- to 256-foot lattice jib. It’s a workhorse designed to provide high capacities at long extended telescopic boom lengths.